Featured artists Jamila Rufaro and Dotti Cichon use elements of nature in their work. Their collaborative piece, Kimono Angel features two thirty-foot rolls of eco-dyed paper held by a weather-rusted angel. 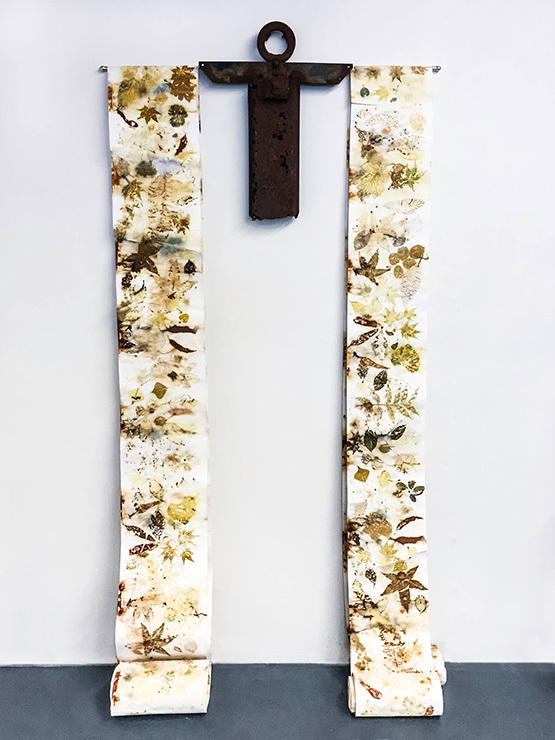 Fire is the main protaganist in eco-prints by Dotti depicting “Burning Man” and Jamila’s eco-dyed pieces use old books to portray imaginary marine life. Paintings portray storms and views of Earth from space showing the effects of global warming. There is an interactive sculpture with video depicting the origins of the Cosmos, a copper-leafed textile work that changes with different light and patinas over time, and silks that are not only wall-hangings, but can be worn as scarves. Exhibition on view through July 27th. Gallery hours: Tuesday–Saturday 12pm–7pm. Free admission. free street parking (after 6pm), $5 flat fee parking in the garage above us.